Yesterday for the first time in 4 years I had to sit at table in a pub with someone who was eating fish and chips. I had no control over what she chose, and despite having asked me why I was vegan and chatted with me about it, she still ordered that. Apparently it never crossed her mind that this was an insensitive thing to do – much less a wrong thing. This person is a Christian too, so clearly ‘stewardship of the creation’ does not include withdrawing support from being part of damaging the marine environment, in her philosophy. I can’t understand any of this. People treat veganism like it is some weird choice for the few. It never enters most people’s heads that they should be doing it too. The most that happens is they shift about looking uncomfortable when you go into it, but just stay depressingly the same. I get sick of this. It’s so easy to be vegan now, there are loads of alternatives to eating animals, countless recipes on line and in books, help from The Vegan Society, Animal Aid and Viva, so many pubs, cafes and restaurants now offering vegan dishes. What is wrong with most people? I feel like I walk among a load of blind savages. Willingly blind. There are none so blind as those who will not see. Even my own extended family – all unthinkingly helping to wreck the earth with their eating habits, all caring nothing, it seems, for animal life except the favoured dogs, cats and other creatures arbitrarily considered ‘honorary’ humans – family pets. If you stab a cow, does she not feel pain like a dog would? If you kick a lamb, is it not the same cruelty as kicking a puppy? If you slam a kitten against a brick wall, is this not outrageous brutality? Then why is it ignored when done to piglets ( as it is in too many slaughterhouses, if people would only take their heads out of their complaisance and look). If all animals feel pain like we do – and they do – why do people willingly carry on paying money into industries that dish out violence and suffering to them? ‘Normal’ milk and ‘real’ cream come from industries that mercilessly exploit cows. The eggs that go into so many cakes come from hens whose lives are miserable and confined, hens who are worn out before they reach their prime and are then ‘trashed’ for petfood. Hens who have been genetically modified to keep on laying eggs until they are weak from the exhaustion of it. In the wild, they would have a maximum of 3 clutches a year. In the wild, little chicks would hatch to the comfort of a mother’s clucking to them, and be sheltered beneath her wing. In the Industry they hatch in huge incubators amongst thousands, no mother in sight or sound, and the males are plucked out and killed. Some are gassed, others fed alive into a macerator (industrial mincer). This is how we treat sensitive, intelligent, fragile creatures – are we not monsters? And who pays for this? People like my friend who sat and ate fish and chips in my presence and ‘dear’ old ladies who love cats and ‘wouldn’t harm a fly’ – except they do – they harm many animals and won’t listen when you try to talk to them about it. I’m sick of people normalising all of this, refusing to have the conversations that might change them, refusing to watch any documentaries that might influence them, refusing to be better people. I am sick of people who think it’s ok to eat fish and chips when in the company of vegans – why should we put up with their horrible food choices, when, for one meal, they could have some consideration and kindness? Why are we made to feel unreasonable for objecting to their savage meal decisions? Why are they so attached to certain foods that they appear to be worshipping them? Why is imagining doing without them for even one meal, such a terrible thing to contemplate? I know the answer of course – it’s nothing more than being stuck in a mindset that has been built up in them from infancy, an indoctrination no less, a relentless drip, drip from everywhere, putting lies into their minds as truths, conditioning them to commit atrocities whilst not understanding that they are doing so: but it is possible, with an open mind and a good heart, to break out of that conditioning. Why are most people so weak they can’t do it? Why so stubborn they won’t do it? Why so selfish they can think of nothing more important than their appetites? It’s not food, its savagery, violence and damage to the whole ecosystem of earth. Fish is the very worst thing anyone could eat. We are killing our seas, depriving marine creatures like dolphins, seals and whales, and all the birds, of their only food sources. We are feeding small ‘bycatch’ to factory farmed animals – small fish and crustaceans that would be food for larger fish, who would be food for other creatures dependent on the sea for survival. We do not need to eat anything from the sea. We can survive and thrive on plant-based eating, and so, because we can do this, we absolutely should. It’s a moral imperative given the sorry state of this planet now and the abundance of plant foods available to us. We are a selfish and greedy species that deserves, if God exists, to be punished for all the crimes we commit against the other creatures who are unfortunate enough to share this planet with us. I am sick of people eating the earth to death and not caring. 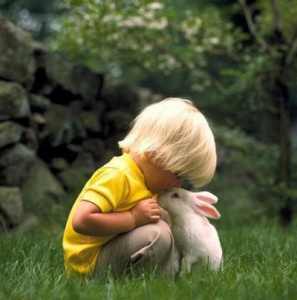 Peace in this world begins with teaching children to eat kindly.